Exactly what you should look for in an oximeter. The BCI Digit® Finger Oximeter is a device that combines a pulse oximeter monitor and sensor into one assembly that measures SpO2 (saturation of oxygen in blood), pulse rate, and pulse strength on the finger. Simply attach the device to someone's finger and read the results! Designed to be used as a "spot check" device, it's great for use in the home, hospital, or in clinical environments. The Digit is used extensively in ground transport and EMS (Emergency Medical Services) settings. 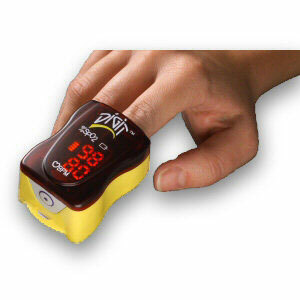 This pulse oximeter will provide reliable measurements on patients ranging from pediatric to adult. The Digit is also great for endurance athletes and home patient monitoring, too. Portable and lightweight, only three ounces including batteries. Uses two standard “AAA” alkaline batteries. Battery life is approximately 16 hours continuous use, 1400 spot check, four-year shelf life. Bright, easy-to-read LED display indicates SpO2 and pulse rate measurements. Low battery indicator when about 30 minutes of battery use remains. Automatic power-down turns the unit off when not in use.